Huawei P30 and the P30 Pro have had a steady stream of leaks for a couple of weeks now. These new smartphones are expected to launch soon and at this point we know quite a lot about these devices. Both these smartphones from Huawei will sport OLED displays with the Pro variant having the bigger 6.47-inch panel with curved edges while the P30 has a smaller 6.1-inch display without the curved edges. These smartphones also get upgraded cameras, bigger batteries, and other updates. 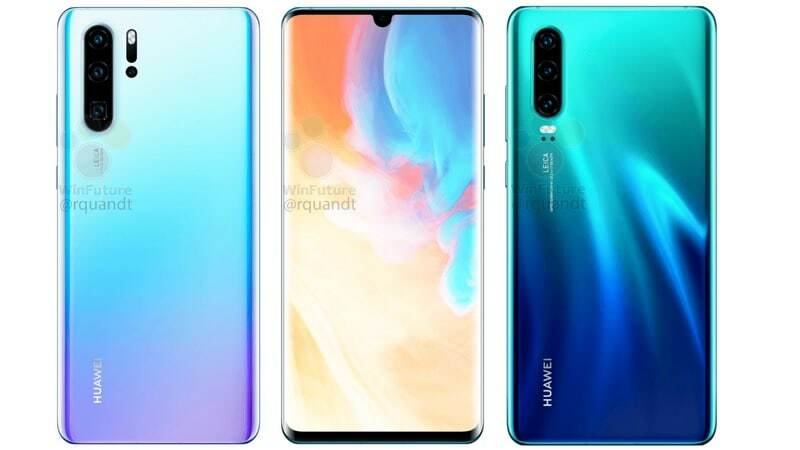 Huawei’s P30 Pro has a bigger OLED panel compared to the Mate 20 Pro which measures 6.47-inches compared to the 6.39-inch screen. The screen resolution, however, is lower at full-HD+ pushing out 1080×2340 pixels. The P30 Pro has curved edges which is a first for the P series lineup. It has a teardrop-shaped notch at the top of the display which houses a 32-megapixel selfie shooter. According to a report by WinFuture the P30 Pro is missing a traditional earpiece, and instead uses the display as the loudspeaker. The previous leaks can stand confirmed as the P30 Pro sports a quad camera setup at the back. Three cameras are positioned in a camera module comprising of a 40-megapixel primary sensor with OIS and an f/1.6 aperture. It also has a 20-megapixel sensor with an f/2.2 aperture and a wide-angle lens. The third 8-megapixel sensor has a periscope style zoom system which lets the P30 Pro manage up to 10X Hybrid zoom. Below the dual LED flash and the laser autofocus hardware, the P30 Pro has a Time-Of-Flight sensor. The Huawei P30 Pro had been spotted on Geekbench running Huawei’s HiSilicon Kirin 980 SoC. The processor is paired with 8GB of RAM and is said to come with 128GB, 256GB, and 512GB storage options. Storage is expandable using a Nano Memory card, a new format that Huawei itself introduced. The device runs EMUI 9.1 on top of Android 9 Pie, has IP68 certification and packs in a 4200mAh battery. From a previous leak we do know that the P30 Pro misses out on a headphone jack. The Huawei P30 isn’t as outlandish, and has a triple camera setup on the back. The camera module consists of a 40-megapixel main sensor with an f/1.8 aperture but lacks image stabilisation. There is a 16-megapixel sensor with a wide-angle lens and an 8-megapixel sensor with an f/2.4 aperture. Together these cameras can manage 5X hybrid zoom. This phone too has a dewdrop notch but the display does not curve at the edges. It also has a 32-megapixel selfie camera that will be used for face recognition. The P30 is also powered by the Kirin 980 SoC but is paired with 6GB of RAM and will only come as a 128GB storage variant. Just like the P30 Pro, storage is expandable. Since the P30 is physically smaller, it packs a small 3,650mAh battery in comparison. The prices of these Huawei P30 and Huawei P30 Pro are unknown at the moment. With the launch event scheduled for the end of this month, we won’t have to wait for long.